Band-search algorithms with adjustable sensitivity for shoulder and double-band finding. Possibility to find and mark uncertain bands/peaks. Quantification of molecular sizes or any other metric unit using linear, logarithmic, combined logarithmic-third power regression, cubic spline or pole functions. Accurate expression of protein or nucleic acid quantities or concentrations based on cubic spline regression using known calibration peaks. Comparative quantification of bands/peaks between groups of patterns. Generation of tables and reports for unlimited numbers of patterns, indicating molecular weight, fragment length, absence/presence or absolute amounts of protein or DNA per band/peak. Search for discriminative bands/peaks between selected groups of patterns; search for unique and common bands/peaks. 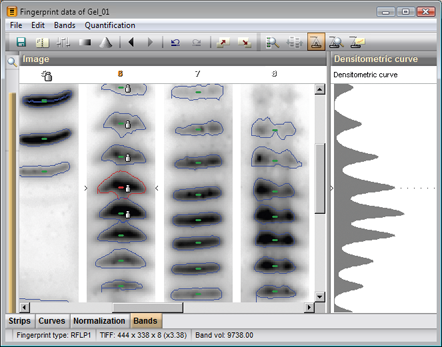 Binary and quantitative band matching tables of multiple combined fingerprints. Possibility to define named band classes based upon size and position (e.g. for DGGE/TGGE analysis). Add/edit bands directly in the comparison window in band matching mode.